If you work within the Early Years sector, our childcare events 2017 provide the perfect opportunity for you to enhance your knowledge and learn the latest innovative techniques that are being introduced within your field. We run a number of free exhibitions throughout the year, which are all teaming with keynote speakers, workshops and seminars. Register your interest today! Who attends our childcare events 2017? Attending one of our childcare events in 2017 is the perfect opportunity to learn more about the different developments taking place within the Early Years sector. These days, parents are paying more attention to the methodologies of their local childcare establishments; our childcare events 2017 provide fantastic opportunities to broaden your horizons and learn more about all the practises that parents are looking out for. Over the years, 1000s of childcare experts have discovered ways to improve their practises, while many have left feeling inspired and full of potential new ideas. We hope you’ll be one of the many leaving us feeling excited about all the different ideas floating around in the childcare hemisphere right now. Where can you attend our eye-opening events? If you would like to book your place, register your interest by clicking here. We’ve made sure that each of our childcare events 2017 is jam-packed full of workshops, seminars, stands and keynote speakers, so don’t worry about one event being better than the other! What can you experience when you attend one of our childcare events in 2017? With the help of inspirational seminars, innovative and fun workshops and speeches from some of the most influential people in the educational field, we aim to inspire every single person who walks through the doors. While our exhibitions are free entry, if you would like to attend any of the seminars or workshops held throughout the day, you will need to book and pay for your tickets in advance, as interest is high! Our seminars are always hotly anticipated among those who are interested in the research being carried out in the Early Years sector. At each one of our childcare events 2017, we have booked some of the most influential keynote speakers to voice their research findings, theories and latest ideas. You’ll be able to gain vital information regarding new childcare policies, and learn new ways in which to employ the latest ideas. 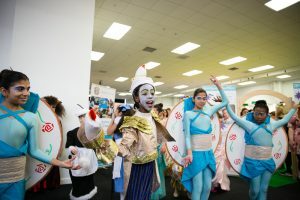 Providing a fun and interactive way in which to learn the latest teaching techniques for the Early Years sector, our workshops have proven incredibly popular throughout the years. And we expect the same for 2017! You’ll get to learn a whole host of low cost or free-to-run educational activities that you can put into practise at your childcare establishment. If you would like to book a stand at one of our 2017 childcare events, or would like some more information about how it works, call us today on 01425 838393. What else can you discover by attending one of our exhibitions? Why should you attend one of our 2017 childcare events? As the longest running childcare exhibition company in the country, we attract the most influential people within the industry. 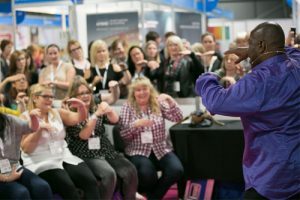 So, while the stands provide an amazing opportunity to network, our workshops and seminars provide incredible ways in which discover, learn and add credit to your CPD file. All in all, the only outcome of attending one our childcare events in 2017 is a positive one. Through building your contacts list and expanding your knowledge, you can collect all the gold stars necessary to running a successful childcare establishment. If you would like to book your place at one our 2017 childcare events, register your interest by clicking here. If you would like to exhibit at one of our shows, click here. Our phone lines are always open to receive your questions. If you have any, call 01425 838393, and our friendly team will be more than happy to help.